Benny Wong of Seattle fights a king salmon in the Tacoma area where salmon fishing has started off on a high note. Hold onto your rod-and-reel as the summer salmon fisheries have started off on a high note in some marine waterways. The Strait of Juan de Fuca king salmon fisheries got off to a relatively good start mainly in the eastern section off Port Angeles and to a slightly lesser degree to the west off Sekiu. WDFW checks showed about one king for every three boats although some were faring much better, and catches just to the west at Freshwater Bay were much better. 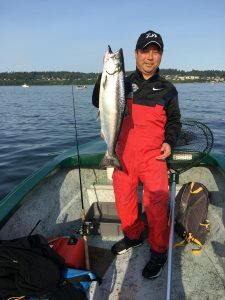 To the western Strait It looked like effort and the catch was down at Sekiu during the initial opener and as of late there were some coho mostly 4 to 5 pounds being caught and the king bite improved this past weekend. 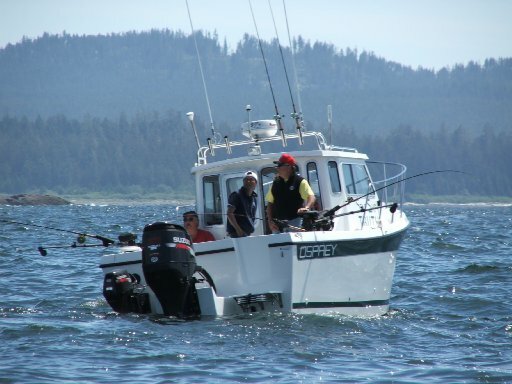 The San Juan Islands continued to produce some decent king fishing with the best and most consistent bite happening at Parker Reef, Point Doughty, outside Smugglers Cove, Spring Pass, Waldron Island and north side of Orcas Island. 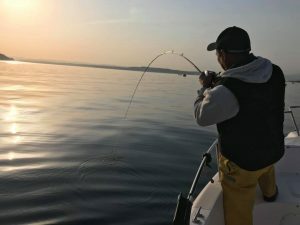 On the coast at Westport it was close to half a chinook per rod and a tenth of a coho per rod with charters and private boats finally finding better action since the initial July 1 opener, and coho action to the south and north improved. 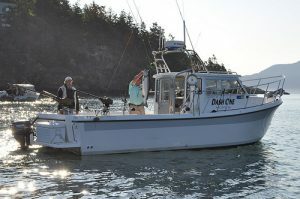 At Ilwaco, 719 anglers June 25 to July 1 caught 156 chinook and 191 hatchery coho for a 0.48 catch per overall (0.22 for chinook and 0.27 for coho). So far, 278 of the 21,000 catch quota have been caught and 533 chinook of the 8,000 quota. At Westport, 428 anglers July 1 caught 211 chinook and 44 hatchery coho for a 0.60 catch per overall (0.49 for chinook and 0.10 for coho). So far, 44 of the 15,040 catch quota have been caught and 211 chinook of the 13,100 quota. At La Push, 40 anglers June 25 to July 1 caught 12 chinook and four hatchery coho for a 0.39 catch per overall (0.29 for chinook and 0.10 for coho). So far, 25 of the 1,090 catch quota have been caught and 26 chinook of the 1,500 quota. At Neah Bay, 736 anglers June 25 to July 1 caught 191 chinook and 444 hatchery coho for a 0.86 catch per overall (0.26 for chinook and 0.60 for coho). So far, 549 of the 4,370 catch quota have been caught and 352 chinook of the 4,900 quota. The recreational coast wide chinook quota this year is 27,500 fish —17,500 fewer fish than the quota in 2017 of 45,000 and 2016 of 35,000. Meanwhile, the coho quota is 42,000 fish, the same as last season and up from 18,900 in 2016. 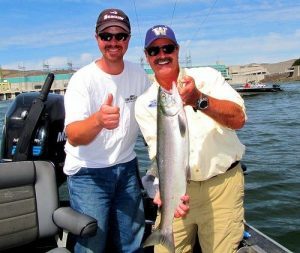 In the Puget Sound region, coho fishing remains very good with fast limits of 2 to 5 pound fish in central Puget Sound mainly off Jefferson Head and Kingston. Anglers continue to report numerous kings caught and released, which bodes well when the hatchery chinook fishery opens on July 16 in both Areas 9 and 10. South-central Puget Sound has been fair to good for hatchery kings in the Tacoma area, entrance to Gig Harbor and the Girl Scout Camp in Colvos Passage. There was also some fish being reported caught south of Southworth Ferry Landing, Dolphin Point off east side of Vashon Island, Three Tree Point, Point Robinson and Beal Point. Mark Baltzell, the WDFW salmon manager provided an update for the Area 11 (south-central Puget Sound) king fishery where through July 1 they were at about 36 percent or 1,947 chinook of the catch quota of 5,344. The week five period (June 25 to July 1) showed 1,259 boats with 2,130 anglers keeping 270 chinook and 440 hatchery-marked chinook and 222 unmarked chinook released. Remember this fishery is driven by the quota and not the encounter rate. Art Tachell, manager of the Point Defiance Park Boathouse in Tacoma, says the number of chinook caught does not represent reality. “I think there needs to be a discussion as soon as (this week with WDFW staff) on what can be done to be able to get through Labor Day weekend,” Tachell said. 1,586 boats with 2,565 anglers June 18-24 kept 538, plus five unmarked (5875 and 436); and1,259 boats with 2,130 anglers June 25-July 1 kept 270 (440 and 222). Many were also focused on the sockeye opener in Baker Lake on Saturday, which was fair at best and WDFW has been trucking all the fish from the Baker River fish-trap straight up into the lake. 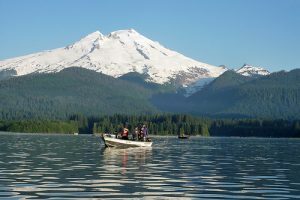 “The Baker trap has seen 426 sockeye (on July 3), 526 (on July 4) and 436 (on July 5),” said Brett Barkdull, a WDFW biologist. 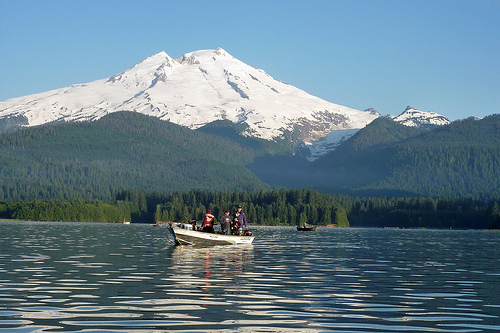 That brings the total fish trapped to 2,475 and 590 transferred to Baker Lake. The Lower Skagit River has been spotty for sockeye although Barkdull says there have been some guys doing well near the Skagit Highway where the fish are funneled up in schools due to the low water flows. The anglers along the plunking bars usually the more traditional hot spots haven’t been doing as well. Sockeye anglers need to think lighter gear tactics and look for sockeye in different locations than they did in 2012 for example when anglers whacked them pretty good. Those places at the moment are pretty dry so if you cast in that direction you’ll be throwing your bait onto a dry beach. Photo courtesy of Dave Graybill who is holding up a nice sockeye he caught in the Upper Columbia. This year’s sockeye forecast to Baker is 35,002 compared to last year’s return of 33,359, which came in below the pre-season forecast. The first year the Baker had a big return was in 2010, and this summer’s return falls kind of right in the middle. Elsewhere the river water levels in places like the Skykomish River from the mouth to the Wallace River have also dropped and are very low, but anglers were scoring a few nice kings running eggs while drifting down the river. It is open through July 31. The Reiter Ponds area has cooled off from the red hot steelhead bite, but still decent at times with the best action occurring in the early morning hours. The sockeye return over Bonneville Dam on the Columbia River is much stronger than anticipated, and has been upgraded to over 200,000 up from the pre-season forecast of 99,000. Anglers fishing for them since it opened last week above Priest Rapids Dam have been doing well and the area above Wells Dam opens on July 16. It is way too early to tell if this means that there will be a sockeye season on Lake Wenatchee but many are crossing their fingers. Roughly 25 percent of the sockeye that come over Bonneville Dam are headed for Lake Wenatchee. A minimum of 23,000 are needed to reach the lake to sustain the run.